This morning we leave Mantova and Lombardy on a journey that takes just under two hours to transport us to another world: Venice, the floating city and entrepôt republic that dominated the trade routes between Europe and the exotic East for much of the mediaeval period. If you haven’t been before, the first sight of tawny Venetian roofs and pastel walls rising from their shimmering reflections in the Lagoon is unforgettable. If you are an old friend, its echoing canals and twisting alleys will delight anew – there is always something to see that you have never seen before. We will travel by train (or private coach TBD) from Mantova to Venice, where upon arrival our luggage will be taken onto our hotel located on San Clemente, a private island within minutes by boat of both Venice and the Lido. Free of our luggage, we will explore the highlights of the Biennale. What could be more appropriate than the theme for the 2019 Biennale, chosen by curator Ralph Rugoff, the American director of London’s Hayward Gallery: May You Live in Interesting Times? The Venice Biennale actually started as an art exhibition in 1895 before adding other cultural disciplines and has existed in its current form for 58 years. It takes place largely in Venice itself; in the Napoleonic-era gardens known as the Giardini della Biennale, with their 30 historic pavilions; and in the Arsenale, where restored buildings are used to exhibit large-scale art and architecture. This is where we will spend a few hours enjoying an expert-led tour of the Central Pavilion and a curated selection of work in the other 29 international pavilions, enjoying the beauty and energy of the gardens and the sheer scale of the Arsenale, once brick ammunition stores for the Republic. Saturated in art, we will be whisked away across the lagoon to our private island hotel, the San Clemente Palace Kempinski. Once checked in, it’s time for exploring our new domain, which includes gardens, an outdoor pool and sunbeds, tennis courts, pitch-and-putt and a spa. 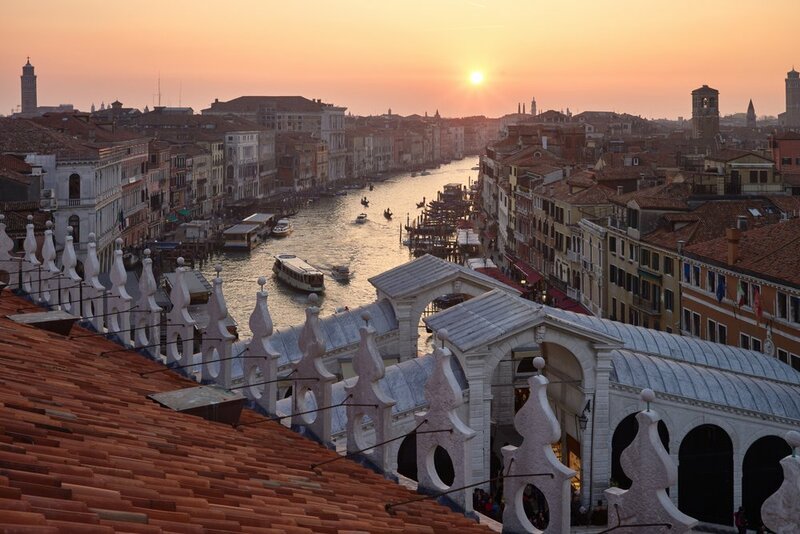 In the evening, the mood is relaxed but elegant as we meet for a light dinner composed of aperitifs and cicchetti – Venetian nibbles – on the terrace of Al Bacaro, overlooking the city of Venice. Al Barcaro hosts a jazz band on Friday nights, perfetto!